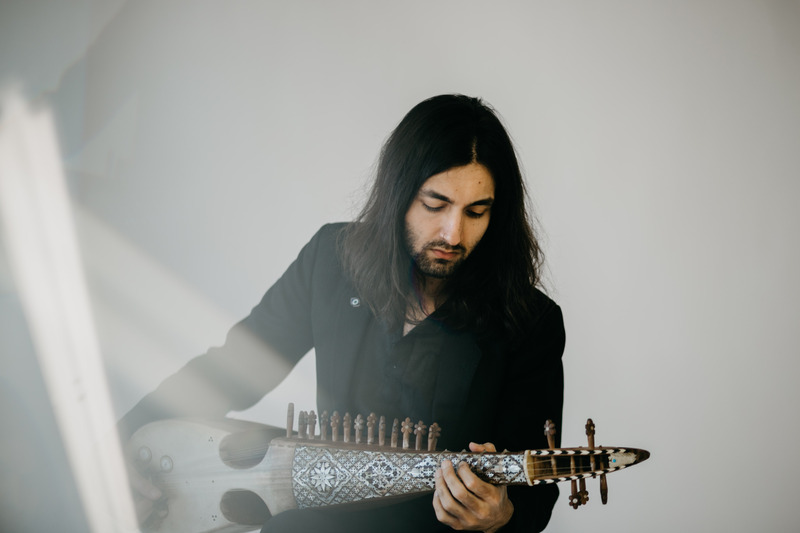 Afghan-American Rabab Player Releases Ethereal Single "Khoda Buwad Ham Rahet"
A teaser for the upcoming third volume of his 'I Am Afghan, Afghani Is Currency' series. Qais Essar is a contemporary Afghan-American composer and musician from Scottsdale, Arizona. He plays the rabab, an ancient Afghan stringed instrument with sympathetic strings and a skin head, and an eerily beautiful resonance that blooms into the space around it. "I have always felt, and talked about how the rabab forms this bubble around you when playing," says Essar in the press kit. "Something about the resonant nature of the instrument creates this seemingly impenetrable force field. Once in the bubble the outside world seems as if it were a thought you had years ago, not present at all." Essar has an impressive resume: he received the "Canadian Screen Award for Best Achievement in Music", and has scored films such as the Golden Globe and Oscar-nominated The Breadwinner. Essar has released three albums, most recently The Ghost You Love Most in 2018. Additionally, he has been pursuing an EP project titled I Am Afghan, Afghani Is Currency, in which he explores and pays homage to Afghanistan's music. "These EPs are pretty unrestricted artistic statements," Essar says of the series; "smaller projects that need not have to be stretched to be full length albums, just are able to exist as they are." He will soon release Volume III-Zahir on Australian label Worlds Within Worlds, in which he draws inspiration from the giants of Indian classical music, as well as minimalist composers Steve Reich and Terry Riley, to interpret the songs of the legends of Afghan song, Ahmad Zahir and Taransaz. His first single from this EP is an instrumental version of a Taransaz track from the 1970s, titled "Khoda Buwad Ham Rahet". Though minimal in instrumentation, the track is beautifully lush: Essar's rabab is backed up with tablas and dilruba, an Indian bowed instrument. Percussive, accelerated rabab runs punctuate the spacious, ethereal expanse woven by the plaintive essence of the instruments. The melancholy melody cascades along, like bubbling mountain water over cold stone. In this track, Qais Essar has built a sublime house of sound. Despite this being the third album in the series, Essar says people still call him "Afghani", as opposed to the proper term "Afghan" to denote a human from the country. "Guess I still have a lot more work to do," he says. To be honest, I don't think his audience would mind hearing that work. Follow Qais Essar on his website and Facebook. Follow Worlds Within Worlds on Bandcamp.